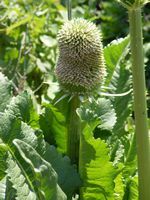 Fuller's Teasel is a biennial herb with a basal rosette of prickly, lanceolate leaves and tall flower spikes that ends in a single large flower - made up of a mass of tiny flowers with lavender, lilac, pink or white flowers. The flower heads tend to bloom in bands of flowers up the stiff flower head from bottom to top. Prefers full sun, is draught tolerant and will grow in any soil but do not like wet poorly drained soils. 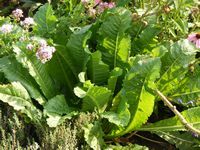 The fresh root of the biennial plant is harvested at the end of the first year - during the second year the plant grows above the ground, while the root becomes increasingly fibrous and loses its medicinal properties. The root is diaphoretic, diuretic and stomachic. An infusion is said to strengthen the stomach, create appetite, remove obstructions of the liver and treat jaundice. Fuller's Teasel has a folk history of use in the treatment of cancer. An ointment made from the roots is used to treat warts, and ringworm. A homeopathic remedy made from the whole flowering plant is used in the treatment of skin diseases. 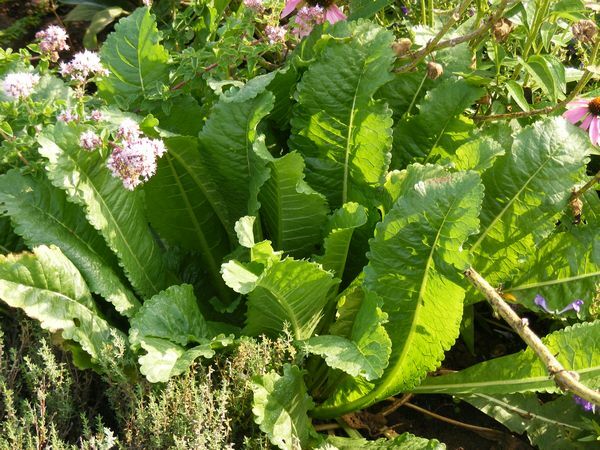 Fuller's Teasel is also claimed to be antibiotic, improve circulation and helpful in curing Lyme disease. Lyme disease is called Tick bite fever in South Africa. A blue dye is obtained from the dried plant and is used as an indigo substitute. The color turns yellow when mixed with alum. Seed heads can be used in dried flower arrangements. The large prickly heads can be used for craft projects. Fullers teasel was originally grown to be used in the wool industry. The large back curving spines on the dried seed heads have been used for carding wool and as a clothes brush for raising the nap on woolen cloth.